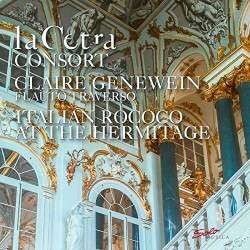 On the Solo Musica label La Cetra Consort and baroque flautist Claire Genewein have collaborated for this album of six chamber works by four composers from the period of art known as Italian Rococo or Late Baroque. Titled Italian Rococo at the Hermitage the majority of the works from Galuppi, Titz and Paisiello in particular all reveal a strong connection to Catherine the Great, Empress of Russia. In 1764 Empress Catherine II acquired Johann Ernst Gotzkowsky’s collection of paintings by great masters Rembrandt, Rubens, Raphael, van Dyck, Hals, Holbein, Titian et al. At the Winter Palace, St. Petersburg the foundation for the modern day Hermitage museum was laid as Catherine’s collection of paintings of other works of art grew so considerably that she commenced a major building program to expand the Hermitage complex into the thousand opulent rooms in existence today. As well as an inveterate art collector the Empress was also an enthusiastic music lover and surrounded herself with some of the most famous musicians in Europe. A great admirer of opera the Empress even wrote opera librettos herself. Italian musicians had already been invited to the Imperial Court but it was under Catherine that renowned opera composers Manfredini, Galuppi, Traetta, Paisiello, Cimarosa and Sarti were engaged in positions such as maestri di cappella. In addition to opera these chiefly Italian composers also wrote much instrumental and chamber music, specialising in the galant style, for performance at gatherings of nobles in the various palaces at the court. During leave of absence as maestro di cappella from St. Mark’s, Venice Baldassare Galuppi served as maestri di cappella to Catherine II in 1765-68. Nicknamed ‘Il Buranello’ after the island of his birth, the Venetian Lagoon Island of Burano, Galuppi is represented here by three works with two of them containing quotations of opera arias. With its enchanting central movement Spirituoso the Concerti a Quattro in G major quotes from the aria S'egli non more a lato from his opera L'Olimpiade and the Flute concerto in D major has a quotation from the aria Nel profondo from Vivaldi’s Orlando. Galuppi’s other contribution here is his Trio in G major for transverse flute, violin and basso continuo—a satisfying, admirably designed score. Not one of the group of Italian musicians at the Imperial Russian Court, Ferdinand Titz was a German composer born in Nuremberg. From 1771 for forty years until his death St. Petersburg became Titz’s adoptive city where he served as composer and a musician at the Imperial Court. Titz is represented here by his charmingly stylish and well considered String Quartet No. 1 in C major. Born in Taranto in Southern Italy Giovanni Paisiello produced almost one hundred operas and in his day was feted all over Europe. Arriving in St. Petersburg in 1776 Paisiello spent eight years at the Imperial Court notably writing a number of operas including Il barbiere di Siviglia for the Empress. Paisiello is represented here by a single score the graceful and high spirited Quartet in G minor for flute, violin, viola and cello cast in two movements. Tommaso Giordani was Naples born but not one of the group of composers and musicians working at the Imperial Russian Court. Active in England and especially in Ireland as well as works for the stage Giordani wrote a quantity of chamber and instrumental scores and is included on this album as a composer who made many transcriptions of opera. Giordani is represented here by his appealing Trio in C major for transverse flute, viola and cello with each of the three movements based on separate arias from Antonio Sacchini opera seria Creso (1765). Especially enriching is the Rondeau movement breezy and engaging. La Cetra Consort consists of members of the La Cetra Baroque Orchestra Basel who are at right at home with these chamber works played on period instruments in an intimate setting. This is top drawer playing both individually and with impeccable ensemble. Early music specialist Claire Genewein on transverse flute is an engaging performer playing with vitality and sensitivity throughout. Recorded at Kapelle Adullam, Basel the sound quality is vividly clear and the instruments attractively toned. Generally the balance is satisfying the only exception being the barely audible harpsichord. Disappointingly the booklet essay contains only bare information about each work an area which should have received improved research. Another grumble is the rather short playing time of less than an hour. It is easy to imagine both the newcomer and the specialist being attracted to this marvellous collection. Irresistible music of unquenchable elegance Italian Rococo at the Hermitage is a desirable album on Solo Musica.